God bless and keep safe and well…especially to my dear friends Jenn, ShaMoo and J-B…. I”m in. I know mine are too long, but I get on a roll and can’t stop. I liked this one. You and I were thinking along the same lines but I was a tad more shamelessly boastful. Wasn’t sure where I wanted to go, but came up with something! And how many far-fetched dreams have I had in my life….too many to count! “Errant dreams . . . far fetched” Deep, sister. Yes, we keep moving forward! First time here.. Loved to see a wonderful site.. So joining here.. Thanks for hosting this meme. I just found you through Nessa. 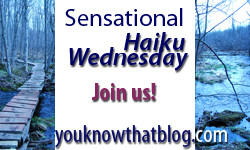 I love haiku and so glad to find some folks who share my insanity! i love this week’s theme! maybe because i can relate to it as i have so many fears regarding the future. so i tried to talk myself out of those fears. let’s all keep on moving forward! Hope to be a regular here too. story of my life too!!! Love the word ‘errant.’ Nicely done, as usual. I wrote about dreams that can’t come true if I am too fearful to pursue them. We both need some confidence! I’m ba-ack (home from Quebec City, and Montreal, Canada)! I do hope all your good dreams come true.